Identifying women who suffer from migraine headaches and/or auras is important because migraines, and aura in particular, are linked to higher risk of stroke. Some hormonal contraceptives can increase that risk further. Recurring, throbbing, severe head pain, often on one side of the head, that can last from 4 to 72 hours. Moving about often makes the migraine headache worse. Nausea, vomiting, and sensitivity to light or noise may also occur. People describe visual auras as bright, shimmering lines or waves around a bright area of lost vision that increase in size and turn into a crescent shape with zigzag edges. 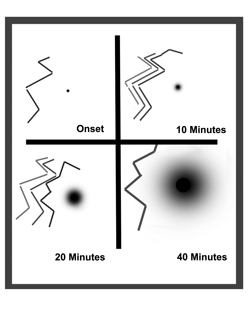 The black spot represents how the area of lost vision increases in size over time. Nervous system disruptions that affect sight and sometimes touch and speech. one side of the face. Some auras also include trouble with speaking. Seeing spots or flashing lights, or having blurred vision, which often occurs during migraine headaches, is not aura. For women who want a hormonal method‡,§ or are using one. If a woman reports having very bad headaches, ask her these questions to tell the difference between a migraine headache and an ordinary headache. If she answers “yes” to any 2 of these questions, she probably suffers from migraine headaches. Continue to Identifying Migraine Auras, below. 1. Do your headaches make you feel sick to your stomach? 2. When you have a headache, do light and noise bother you a lot more than when you do not have a headache? 3. Do you have headaches that stop you from working or carrying out your usual activities for one day or more?